Who’s ready for a midweek peanut butter & chocolate pick me up? I know I am. We’re in the final stretches of Winter and I am sooo ready for a little more sunshine and a little less cloud. Though we do live in one of the rainiest areas in the UK so I don’t think I’m ever going to be escaping the clouds much as long as we live here. Boo. At least there’s a definite shift in the air with Spring right around the corner. Now that we’re in March we’ve reached that time of the year where the weather just can’t make up its mind. Last week we went from mild grey clouds to heavy snow to sunny blue skies all in about 30 minutes. So, yes. I’m ready to get down with these peanut butter chocolate oat bars. Are you?? 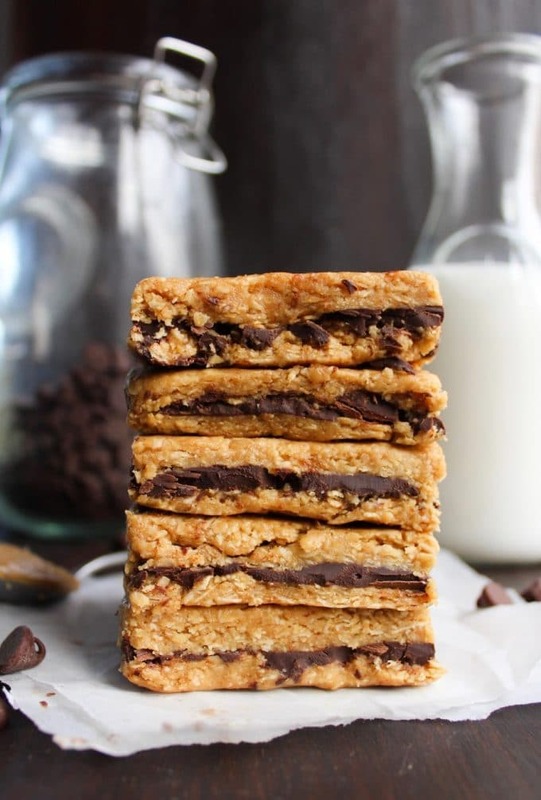 As a no bake four ingredients, these bars couldn’t be any easier to make. I used a handheld mixer in the video but that was more for the sake of speed. Feel free to mix these the old fashioned way with nothing but a spoon and upper body strength. My kind of arm workout. I’ve tested this recipe using both rolled oats and porridge oats – both work just fine. The bars made with porridge oats (pictured here) came out a tad softer, but that was the only real difference. I often use maple and honey interchangeably in most recipes but I wouldn’t recommend using maple here. It’s not quite as sticky as honey or rice syrup which is important for binding everything together along with the peanut butter. Make sure you place the bars in the fridge or freezer after you spread the chocolate before adding the final layer of peanut butter & oats. If you add the last layer before the chocolate has a chance to set you’ll end up with very messy bars. Still tasty, just not as pretty. So in case you too are in need of a little pick-me-up (no matter the day of the week or month of the year) I hope you enjoy these as much as we do! 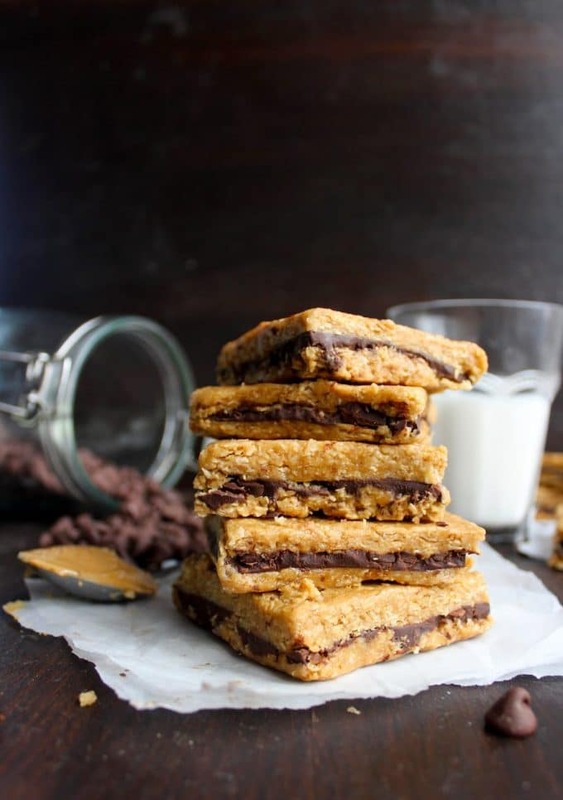 Don’t forget to #asaucykitchen on instagram if you try these Peanut Butter Chocolate Oat Bars! I love seeing what you make with! You can also post your pictures to our facebook page! 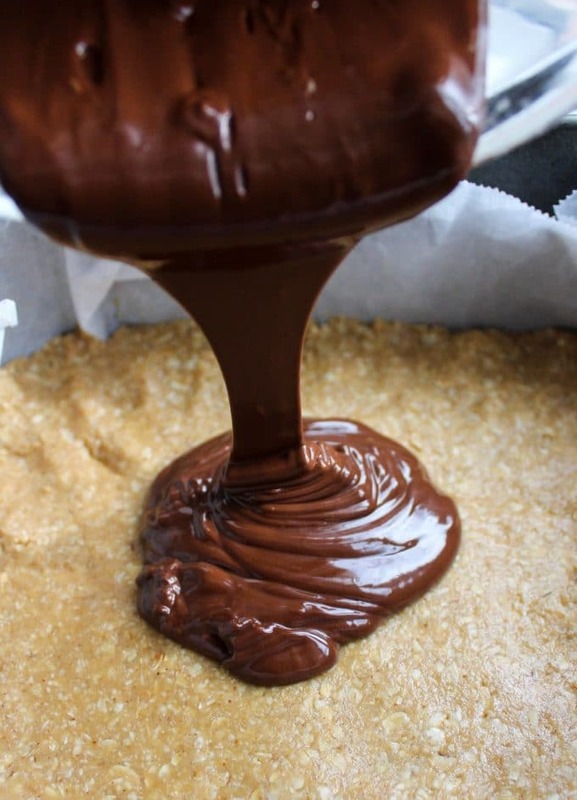 Place the chocolate in a heat proof bowl that's large enough to sit over the top of a sauce pan. Add an inch of water to the sauce pan and bring to a simmer. Once the water is simmering place the bowl of chocolate over the top of the bowl, make sure that the water doesn't touch the bottom. Stir the chocolate as it melts. When there are only a few chunks of chocolate left remove the bowl from the heat. The residual heat will be enough to melt the rest. Set the bowl aside to let the chocolate cool while you prep the next part. In a medium sized bowl using a hand held mixer mix together the peanut butter, honey or rice syrup, and oats. Blend everything together until fully mixed. Your dough should be clumping together in one ball. Divide the mixture in half. Press 1/2 of the peanut butter mixture into the bottom of a 8x8 inch baking pan that's lined with foil or parchment paper - you want to line the pan with something that will allow you to easily pull out the bars when you're ready to slice. Once 1/2 of the dough is pressed firmly into the bottom and sides of the pan spread the melted chocolate over the top in a smooth even layer. Once the chocolate is spread across the top, place the baking pan in the fridge for about 20 minutes to let the chocolate set before adding the final layer. You can also place it in the freezer to speed things up. Pull the pan out of the fridge and press the remaining 1/2 of the dough over the top of the chocolate. Place the pan back in the fridge for another 5-10 minutes to let everything firm up one last time before cutting into the bars. Keep these stored in the fridge. I have made these bars a few times and each time they have turned out delightful. Instead of peanut butter, I used almond butter. I also added some extra ingredients to enhance the snacking experience by adding chia seeds and toasted pumpkin seeds! Here’s a tip: If you want the top layer of oats to meld with the chocolate without it crumbling, I suggest warming the oat mixture for just about 15-30 seconds. That way when you layer it on top of the chocolate, it will adhere to it more efficiently. I had no issues with crumbly bars. 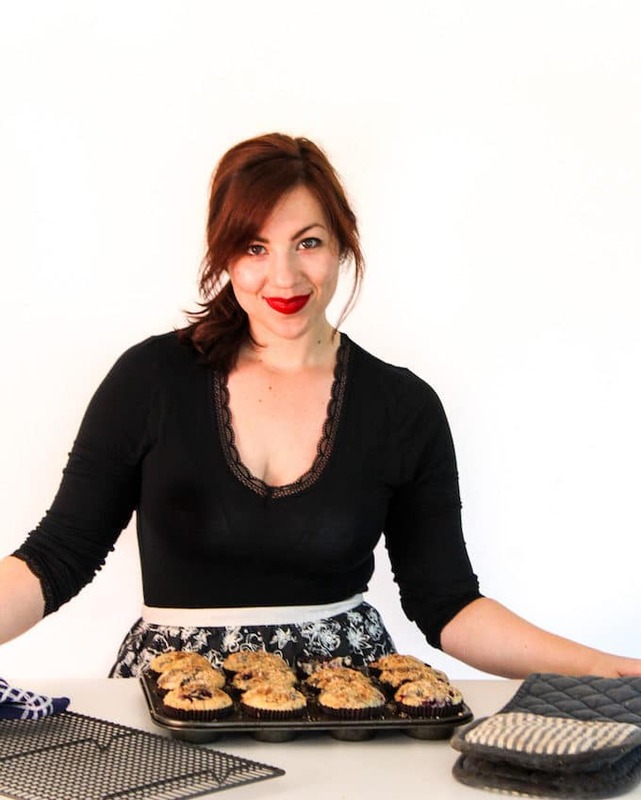 These are definitely going to be a common sweet tooth staple for myself and for friends! I like the way you think – all of those variations sound amazing! Love the tip about the oats too, such a great idea! Thanks so much for coming back to let me know what you thought and for sharing how you make them! This looks awesome! I have old fashioned oats – would that work for this recipe? I also was thinkig about just making these into peanut butter honey oat bars and just omitting the chocolate! What do you think? Perhaps I could even add nuts! Can’t go wrong with chocolate and pb! My favorite combination – melting the chocolate and letting it set is so worth that little extra effort in my opinion. Do these need to be kept in the fridge? Would they be suitable (not too crumbly) for a multi day hiking snack for example?